I’m in Singapore on my way out to Jakarta for my second visit to Indonesia this year. So it seems an appropriate point to reference a presentation I will be providing in December on ‘Global HR Trends and Differences’. In a previous post I noted the opportunity for the UK’s CIPD to use social media as a basis for improving its annual conference. Well, recognising that no dedicated resource currently exists to help develop a virtual network within the HR community, HR.com is launching its new role as a provider of virtual conferences for HR (VIEW: Virtual Interactive Educational World) with a special 2 day event on 12th and 13th December. HR.com aims to take the most successful elements of a live HR conference and transform them into the virtual world of the Internet. 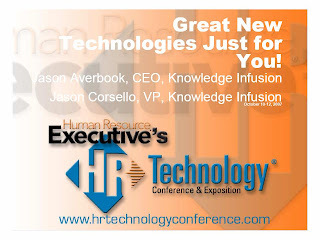 HR.com’s virtual sessions will include online presentations, over 100 virtual booths, online chats, product demonstrations, and opportunities to gather information. After Harrogate, I said that the benefits of using social networking for this type of conference would be social as well as educational. 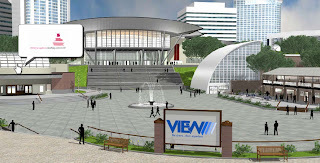 And the VIEW conferences will provide the ability for over 1000 attendees to network and to interact with each other online, and to exchange information. The events will allow HR professionals to attend a full-day of interactive learning through webcasts, group chats, break-out sessions, ask the expert workshops and even keynote addresses from industry leaders (HR.com have mentioned Carly Fiorina, Marcus Buckingham, Dave Ulrich, Kenny Moore, Keith Ferrazi and Beverly Kaye) - all without ever leaving the office. Whole HR teams can also get involved – customizing and prioritizing their attendance according to what is important to each person. I think there is a great opportunity here – in the UK at least, HR practitioners are finding it increasingly difficult and costly to take time away from the office to attend traditional events. The format also allows presenters and participants from all around the world to get involved. I will be participating in the inaugural 2 day event, presenting on ‘Global HR Trends and Differences’ in the Training and Development pavilion at 4.00pm ET (9.00pm GMT) on the first day of the conference (Wednesday 12th). I think this will be an important session within the programme. HR.com’s technology undoubtedly provides significant benefits for global participation, but it’s important that we don’t extrapolate this point and start thinking that we can treat everyone from all corners of the world in the same way. As I’ve posted previously, despite the flattening of the earth, there are still some big differences between countries, cultures and populations. My session will look at how we can best take account of these. Come along and join me there if you can (attendance is free for all HR professionals). The session will also be available for 7 days after the original presentation. For a quick preview of VIEW, visit www.hr.com/virtual. Writing in yesterday's FT, Stefan Stern commented on a new book I had not previously come across: Change to Strange - Create a Great Organisation by Building a Strange Workforce, by Dan Cable. 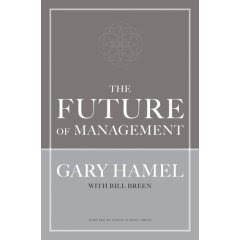 The author's idea seems to be that organisations can successfully differentiate themselves by developing 'strange' cultures, as well as product / service features etc. "Strategy gurus tell us that businesses have to differentiate themselves in the market if they want to achieve a competitive advantage over their rivals. Customers will not be interested in a 'me too' experience that offers nothing not already available at a similar (or better) price from another well-established player. 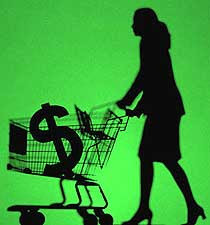 A superior product or service may help you pull away from the pack for a limited period of time. But products and services can and will be copied sooner or later. Much harder to imitate is the unique culture your organisation possesses. So, far from 'benchmarking' yourself against your competitors' best practices and formalising the way you do things to eliminate quirks and eccentricities, maybe you should be heading in precisely the opposite direction. Accentuate your differences, even to the point of becoming a little bit weird." Stefan Stern provides Starbucks as an example of strangeness, with its passion for the 'Starbucks experience': the aroma of coffee, the sight of staff scooping coffee beans and pouring them into grinders, etc. Or for a non-business example, a winner at a hot-dog eating contest who has a special and unparalleled devotion to the craft, someone who "executes a process like a machine". "The trick, Prof Cable says, is to find your organisation's equivalent of a hot dog eating contest. 'What strange activity is it that you and your workforce have mastered better than anyone else?'... Sure, this is not normal behaviour. It is obsessive. But it will set you apart - and be hard for your rivals to copy." This relates directly to my recent posts on organisational capability. The key for me, which I've also already posted on, is to identify not just this strange activity, but the people who will be key to, and also motivated by delivering this, and then to align all HCM processes around this strangeness. Just a reminder about InfoHRM's European conference in December. This the the first conference InfoHRM have run in Europe, but I know their events in US and Australia are very well regarded, and I am sure this one will be too. I've just been completing my slides for my keynote at the end of the second day. I'll be talking about using measurement of human capital / human capital management to create value for the business, using talent management as an example application. I'm also going to be able to attend both days of the conference and am looking forward to it enormously - particularly the earlier keynote from Anthony Rucci, at Ohio State, but who was, of course, behind the seminal service profit chain study at Sears. A sense of fair-play is an innate characteristic of humans. There is a well known psychological experiment in which a 'proposer' divides a reward between him / her and a 'responder'. The responder can either accept or reject this. If he / she rejects it, both players receive nothing. Economics suggests that the responder should accept any division in which their share is not zero. But that is not what happens. "Scores of studies have run the ultimatum game across cultures and ages. Universally, people reject any share lower than 2-% - apparently to punish the greed of the proposer. People do not act like Homo economicus. Instead, they are the arbiters of fairness." 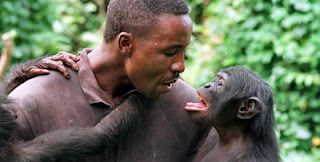 The article then goes on to review a series of experiments that contrast this sense of fair play in humans compared to its absence in chimpanzees. So this characteristic really is something rather special. "The company has no internal audit staff. No one double-checks expense reports. Instead, Semco works hard to cultivate a deep sense of honour and trust among its employees, and since employees share in the profits of the unit, they have a big stake in rooting out fraudulent behaviour." I bet fraud isn't a big an issue for Semco as it would seem to be elsewhere. 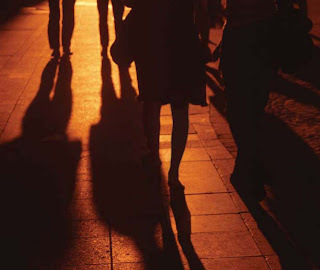 Last week’s Personnel Today included a short story on fraud. I’ve already posted on a similar survey looking at issues associated with a potential influenza pandemic and this is another key issue which is easy to miss as HR focuses on its strategic agenda. Fraudsters are costing British businesses a staggering £4m a day, according to new research. A survey from accountants BDO Stoy Hayward has revealed a 40% increase in reported business fraud in the UK last year, with the total sum lost around £1.37bn. The most common scams include bogus invoicing, manipulating of accounts and ghost employees appearing on company payrolls. The warning follows the annual Global Economic Crime Survey by business consultancy PricewaterhouseCoopers, which revealed that the average cost to UK businesses affected by fraud had doubled to £1.75m in the past year. The survey found a 21% increase in the implementation of whistleblowing systems, but half of the 5,400 respondents said they were effective, and only 3% of serious incidents were detected by such systems. Stuart Little, commercial litigation partner at law firm Shoosmiths, warned that size was no protection for companies when it came to fraud. Little said the best way for businesses to protect themselves was to create an anti-fraud culture where whistle-blowers were happy to come forward. My response which was summarised in Personnel Today was that although business and in particular, employee fraud is clearly a significant issue for most organisations (and troublingly, PwC's, BDO’s research and Shoosmiths’ comment suggest that the problem is getting worse), I’d suggest that just focusing on the problem isn’t going to provide the whole solution. The right internal procedures and controls will help to manage the problem, but if people are going to engage in fraudulent activities, they will soon find other means of doing this once one activity is controlled. The real issue is why employees are conducting fraud. Have recruitment processes failed to select honest people? Or has trust between the organisation and at least some of its employees completely disappeared? Positive psychology suggests that focusing on a problem just tends to make this problem more likely to occur. A good example is absence management. If absence is a problem, there are certain things that an organisation can and should do to reduce it. But even more importantly, the organisation needs to improve the engagement of its staff. Engaged employees will not participate in fraud, and will also be less likely to tolerate those few who do. This is why I agree with Stuart Little’s comment that the key is creating a culture in which whistle-blowers are happy to come forward. In my previous post, I noted that integrated HCM systems like Authoria can go some way towards helping organisations create value through their people. This is my view about what. Firstly, an organisation need a clear HCM strategy that focuses on developing a particular organisational capability (human, organisation and / or social capital). This capability needs to be something that will make a difference for the particular organisation at a particular, although relatively long-term point in its development. Secondly, the organisation needs to identify the sort of people who will be key to providing this organisational capability, and thirdly, it needs to focus its management and HR processes on a) creating this capability, and b) appealing to the group of people it is targeting (ie becoming an employer of choice for the people it chooses). Doing this is likely to result in best fit vs best practice HR processes. Once these processes have been identified, the organisation can then review what technologies will best enable and integrate these best fit requirements. Some of Tod's examples got quite close to this. For example, Hess requires quality decisions on oil to be made by some of the best petroleum engineers. This is difficult because less people are graduating in petroleum engineering, and particularly because Hess finds it difficult to attract engineers to its location when it is competing against organisations with very strong employer brands / propositions like Google. So it needs to retain the engineers it has. HR processes = retaining these people. But this is still a fairly traditional type of approach / level of value, so I would say the example relates to HRM vs HCM. Hess is only going to create value through its people if it finds a way to differentiate the organisation through its people, rather than simply dealing with problems in executing its business strategy. I was talking about this at a session run by Infobasis last week. I was challenged that my views on organisational capability / HCM are pretty much common sense (I guess that this is actually a fairly good thing!). I responded that yes, that this is probably the case, apart from the identification of the organisational capability itself. 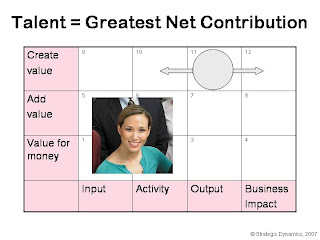 This is where the real art in HCM strategy development lies: what is it that is going to enable an organisation to create value through its people? And, despite some of my recent posts, I'm not against measurement in HCM. 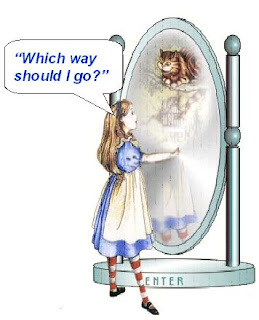 I just think it's important to recognise that answering the question above lies in taking an emotional leap into the unknown, rather than rational analysis of data. For a number of years, I’ve tended to believe that given the time and cost required to implement HR systems, organisations should generally focus on implementing the HCM modules of their ERP systems to the fullest extent, and then supplement this with particular best of breed / point solutions to provided additional functionality in areas which are important to them (ie fit with their individual HCM strategy). For those organisations which need to purchase point solutions in performance management, compensation or recruitment, Authoria may provide a good choice. However, I am slowly coming round to the view that a using an integrated HCM suite in preference to the HCM functions of an ERP system may increasingly provide an appropriate approach. And Authoria looks like a very good best here. This isn’t just my opinion: Authoria recently came top in HR Technology conference’s integrated recruitment and performance management shootout (and their performance and compensation shootout in 2005). rich User Interface with embedded tutorials and wizards." So yesterday, I attended Authoria’s European roundtable meeting. Their CEO, Tod Loofbourrow did a great job of explaining the benefits of integration, describing clients which have used this functionality, being able to identify who is performing, how to get more people like this, and from the other direction, which sources of talent produce people who can perform well over time. One of Tod's examples was Pepsi Americas (one of the drink's major bottlers). The point that the 'rubber hits the road' in this business is product placement in the retail stores. So if one of the company's representatives notices that the store is near a local University, they need to be able to suggest that the store may want to stock more high caffeine drinks to help the students through their exams. So it's important that the company's truck drivers are able to talk to the store owners, and for this they need well developed social skills. This implies a very different set of competencies, which can be managed through integrated systems spanning performance management and reward. Authoria's extension into recruitment is another plus as the bottler can also benefit by linking the truck driver competencies into their recruitment systems. And what about using the ERP system to do some of this? Well, Tod's perspective is that there is a greater requirement to share data across the front office: the various elements of HCM functionality (recruitment, performance management and compensation), than there is between these elements and the back office: the data contained in the ERP system. And now that HR can integrate automated HCM processes in this way, Tod believes that “there is no fundamental reason that HR cannot be the most strategic function within the business”. I agree with this vision, and that integrated HCM technology can be an enabler towards this goal, but I think that a lot more is required too, which I’ll try to explain in my next post. 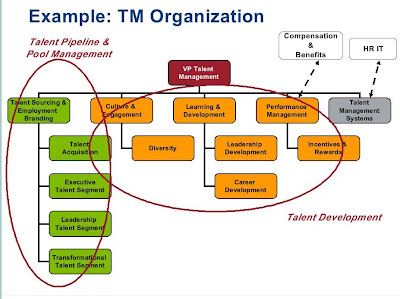 I've posted fairly recently on integrated HCM systems, but this post has been getting plenty of traffic so I thought you’d be interested that Leighanne Levensaler at Bersin & Associates has been presenting on Bersin’s new research, focussing on the challenges organisations are facing as they move from disparate, siloed systems to integrated talent management (I would say HCM) systems. I've just caught Leighanne’s webinars delivered via their own site yesterday, and via Plateau tonight. Like AMR Research, Bersin stress that this is early days for these integrated systems. 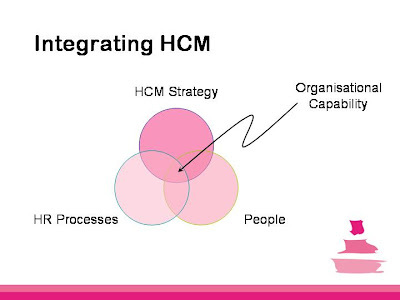 Only 13% of Bersin’s sampled organisations have an integrated HCM system strategy in place today. The rest use a range of ERP and point solutions with the main point systems in use, more in less in order of their evolution, being recruitment, learning, performance management, compensation, competency management (I found it surprising that this central requirement comes out so low) and succession. However, 62% of these organisations are in the process of developing an HCM system strategy. 29% expect to build their strategy upon a number of best of breed / point solutions (often requiring the organisation to deal with complex challenges including building a data warehouse, a portal interface etc), but what I found to be a surprisingly high 28% expect to use an integrated HCM approach. Only 13% expect to use the HCM modules of their ERP system. This is lower than I would have expected and as I suggested in my last post (but then I did suggest that organisations might use their ERP – plus – one or more best of breed solutions in areas which are most important for them – depending upon their business and HCM strategy). Also like AMR Research, Bersin stress that there is no boilerplate system strategy solution – what technology is appropriate depends upon an organisation’s business strategy and should focus on solving critical business problems rather than just simplifying implementation and operations. 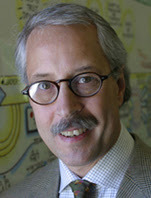 Organisations should start to develop their HCM system strategy by starting with a business problem and the overall HCM strategy to deal with this problem – but – they should also explore what is possible with integrated technology and let this influence their overall HCM strategy - if their options are not to be limited. (I think Systematic HR had a good post on this earlier this year but I can't find it). The use of integrated HCM systems does seem to help organisations implement key talent initiatives, for example workforce planning, employee engagement and retaining top performers. After my last post on HCM technology, Scott McArthur ranted about the number of HR professionals who are aware of these opportunities. I suspect not that many. So it’s disappointing that neither of Bersin’s webinars were attended by that many people. The subject and the research are both important enough to have deserved more. Diversity is an absolutely critical part of just about any organisation's strategic capability, and a core accountability for HR. I've had some of my comments on using mystery shopping techniques to assure diversity in recruitment processes published at the Work Clinic blog. You can review the post and comments here. What do you think? Please comment on that or this blog. 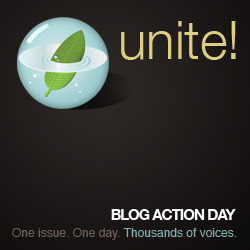 Today is blog action day. Bloggers around the web are uniting to put a single important issue on everyone’s mind - the environment. Every blogger will post about the environment in their own way and relating to their own topic. The organiser's aim is to get everyone talking towards a better future. The environment has been selected as the 2007 theme - both for the clarity of its importance and the undeniable urgency that issues like global warming and pollution have. It is an issue that can relate to virtually any subject, any blog and anybody. I only came across this initiative at the end of last week and had a quick think over the weekend about what I might write, but I have posted on HR's role in supporting green issues fairly recently, and more generally have commented on environmentally friendly initiatives at the Work Clinic. And I'm out of new stuff. So this evening, I've had a quick look at a very few of the 15,861 blogs which are joining in. A common theme seems to be that, yes, this day is a good idea to increase communications about the environment, but that communications is clearly not enough. I've already made a commitment to save energy but I know there is a lot more I can do. There is a lot more we can all do, and have to do (I tend to go with Al Gore rather than Stewart Dimmock on this). My dad's perspective is that the biggest challenge in dealing with environmental risk is that whatever clever technology we invent, and however much we all take personal responsibility for reducing our environmental footprint, we are still very unlikely to be able to have an impact which will be as great as is required. The reason for this is that improving the environment is going to require slowing down our rate of growth - and no political party is ever going to be brave enough to admit this fact (perhaps unless Gore does stand for President in the US?). So the conclusion of my post is that politicians should look at the number of people who have participated in this communication, and take a risk to tell people what they really believe about the environment and what we will need to do to stabilise it. Current actions (or inactions) are not going to be enough. We need to be much more radical and if necessary, slaughter a few sacred cows. And I commit that, whichever party does do this (when Gordon Brown finally gets round to calling an election in the UK) will get my vote (even if it is the Lib Dems). While there is generally much less focus on competencies across the HR profession than there was a decade or so ago, this recommendation still makes a lot of sense. Infact, I think everyone already realise it. 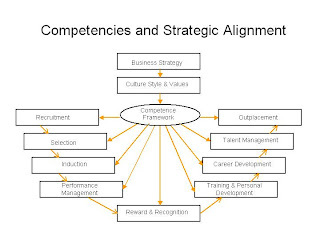 But I'm not sure many organisations, or HCM systems, do really put competencies at the centre of their approach. One system that does, although with a more granular and potentially more useful focus on skills, is provided by Infobasis, a provider of a Total Capability Management system (TCM), for whom I am making a presentation next week (one of their Directors, Don Taylor is also presenting on TCM in a Learning Light webinar on Tuesday 16th October). One build I would make on these approaches is just to suggest that we need to remember that employment is a two-way relationship. It is great to be able to measure and assess someone’s and the organisation’s skills and competencies. But organisations also need to think about what value they are providing to their employees if their relationship is going to be both productive and enduring. I therefore recommend that organisations think about not just one, but two fundamental frameworks at the heart of the HCM strategy: a skills or competency framework, and an engagement framework that articulates employees’ expectations of their employment relationship, and how well the organisation is doing in delivering against this. Like a skills or competency framework, the engagement framework can be constructed at all different levels in the organisation, from the top, high-level view to each individual employee (at least those identified by the organisation as its most valuable sources of human capital ie its talent). I’ll come back and post further about this at a later date. AMR Research have published a report helping organisations to understand their options for investing in integrated HCM technologies (which AMR define as systems spanning at least two out of the following four HCM processes: acquisition, management, development and assessment). The firm finds that vendors have been using both acquisition and organic development to quickly develop their systems’ capabilities to integrate these HCM processes. So spot systems that were initially designed to solve just one business problem (eg not finding enough qualified candidates, tracking employee time, providing large-scale distributed training, and doing annual performance reviews) are now being developed to have much broader coverage. So whereas organisations used to face a fairly straight forward choice between using their ERP provider's HCM module and implementing best of breed point applications, managing data and process integration between them (increasingly enabled through open standards such as XML), they are now increasingly being provided with a third option: to standardise on applications that are part of an integrated HCM suite. And this option looks to be increasingly attractive. AMR Research’s report notes that organisations tend to prefer staying with one vendor as their organisation’s HCM programme matures, with a view to pursuing other areas of functionality, rather than purchasing many separate point solutions. However, in my view and experience, for large organisations at least, the best solution will still most usually be the HCM suite of their ERP system. Many organisations are still not using anything like the full functionality that comes within these systems. AMR Research note that SAP’s strategic capabilities, for example, have, by and large, “not been deployed among the more than 10,000 enterprises that have licensed SAP HCM to date”. Only about 2,000 customers use SAP’s training and events (development) and time and attendance (management) capabilities, and only 125 use its assessment functionality which are included in its ERP HCM 6.0 system. “For the SAP E-Recruiting and E-Learning modules that are sold separately, the company has shipped about 400 licenses each, of which it believes there are 150 live in deployment.” However, AMR Research also note that “interest in the product offerings’ latest developments has been very high”. A good example of this enhanced usability is Taleo’s new performance management systems. Although I’ve not seen this myself, Jason Corsello at Human Capitalist, amongst others, note that some design concepts otherwise unseen in today’s market make the system look very impressive. An example is the ‘talent card’ based upon a baseball card with the employee picture on one side and their employee stats on the other. Another of my favourite systems is Authoria which we are using alongside PeopleSoft on ASC's HR outsourcing project at GSK. The sort of usability these systems offer is a very big plus. 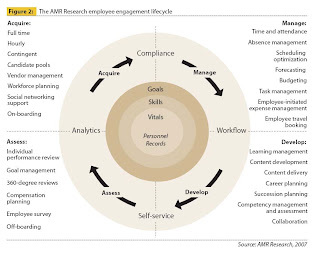 AMR Research state that they believe “the solutions that are most compelling to front-line employees to want to use them everyday will drive strategic HCM suite and ultimate strategic HCM initiative success”. However, even best of breed systems are only a couple of years ahead of their ERP rivals and this distance is diminishing as the ERP firms catch up and buy up their competitors. And the ERP systems offer other advantages through providing a single source of truth for strategic as well as transactional views on all employee data. So although I understand that best of breed solutions may add value when used alongside an ERP system, I am less convinced that non-ERP integrated HCM suites will often offer the same level of value for large organisations. AMR Research note that no single provider truly supports the entire breadth of HCM processes, and in many cases, their systems’ functionality and marketing messages are well ahead of customer requirements. For small to medium sized organisations, it may be a different issue. However, SAP's move to Software as a Service (SaaS) should help their system become much more appropriate to small and medium sized organisations too. However, if you are going to invest in an integrated HCM suite, you need to understand your potential suppliers’ heritage ie whether it has developed from a focus on acquisition (eg Kenexa, Taleo, Vurv), management (Authoria, HRsmart, Workstream), development (Plateau, Saba, SumTotal) or assessment (Pilat, SuccessFactors), as well as their plans for expanding functionality. And you need to ensure that this fits with your organisation’s particular perspective on HCM. Bersin are also releasing their new research into integrated 'talent management' suites (for example, in this Plateau webinar to be presented by Leighanne Levensaler). I'm working my way through Lynda Gratton's Hot Spots. One of the key elements of hot spots is boundary spanning. As an example of this, Gratton provides BP's peer assist process, which she has talked and written about for several years. This is a process that was introduced by BP's former Chief Executive, John Brown, to break the organisation into small businesses in order to encourage learning and avoid duplication across the separate businesses. The process fundamentally shifted the organisation from a vertical axis to a horizontal axis, creating groups within the separate 150 business called peer groups, each made up of up to 12 business units all operating in the same area. Brown then introduced two sets of conversations, peer assist and peer challenge, which held the top two business units in a peer group responsible for the performance of lower two units. 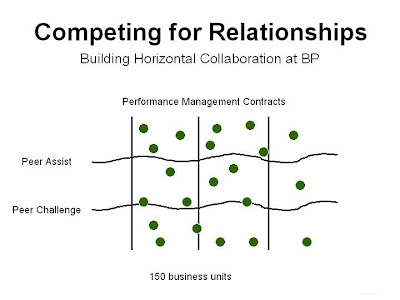 And BP linked 50% of managers' bonuses not to how each individual business unit behaved, but how these two lowest performers behaved. So instead of one oil refinery manager competing with another, which is what would normally have happened, the top one would go to the lowest and say, "What can we do to help you?" It has gradually become a part of the culture for peers to help each other. BP has called in Bain to simplify the company's structure. So what does this change mean for boundary spanning and the development of hot spots? Not that much really. Gratton provides peer assist as an example of a 'signature process': 'a process that differs significantly from general views of best practice' ie demonstrates best fit. This signature is a 'direct embodiment of the history and values of the company and its top executive team'. So it's no wonder that when the executive team changes, and particularly when this team needs to signal a break from previous problems, the signature processes should be adapted too (although I do think to be effective they need to be maintained over a relatively long term). * Note I'm not doing any work at BP so I can't confirm whether this simplification relates to the peer group structure, and to the peer assist and peer challenge processes. But it does seem likely. Scott McArthur has some great new posts on his blog. Referring to Meaning Inc, Scott suggests that the key challenge faced by HR (HCM?) is to provide an environment in which meaning is created. I particularly like his post, HR and the business delusion, not just for the drawings, but because I think the post hits the nail on the head: HR may need to have a good understanding of the business and its numbers to gain credibility across the business, but this isn't what enables it to maximise its impact on the business. In my terminology, an understanding of the numbers are the basis for HRM, not for HCM. But whatever we call this, the future direction of HR an important issue for the HR community to resolve. Can / should HR take on more accountability?